Beginning in the 18th century, insurance fire plaques were attached high up on buildings, indicating which were insured and by whom, as an advertisement, to advise insurance agents and more importantly to attract the fire engine in the event of fire. There are at least three insurance plaques still existing in Quorn, and evidence of where others were once attached. 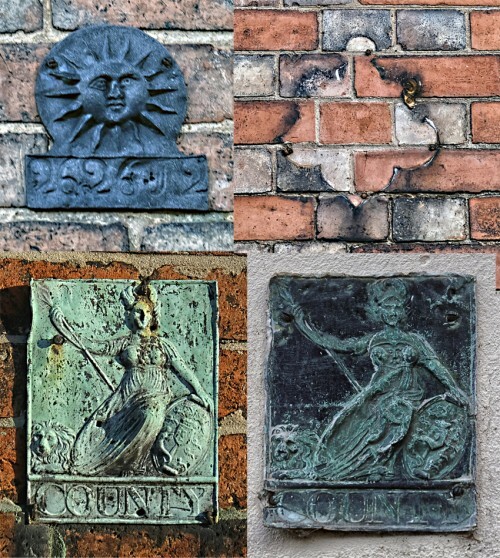 Top left is a Sun Insurance plaque, the first fire insurance company, established in 1710. The plaques were made of lead, and each one had the policy number inscribed underneath it. Top right is a mark on the front of Wright’s factory on Leicester Road, where there used to be a Royal Insurance Company plaque. The bottom two are late 19th century pressed copper plaques from the County Insurance Company. Thanks to Alun Williams for the excellent photographs.